A love of travel and urban landscapes inspired by Trussardi at creating a new advertising campaign Spring-Summer 2018. Young and vivid characters in the Billy Kidd’s lens like characters in an old adventure film with a modern twist. They are energetic, creative and ready for custom actions. As the set for a new advertising campaign was unusual for Trussardi selected locations in the vicinity of Milan. Classic buildings, museums and magnificent buildings of the Central streets of the city were replaced by urban view with graffiti, bridges and roofs. Posing around a vintage car or standing amid the iconic city Tower “Velasca” heroes campaign, emphasize a bold and modern style collection. Under the guidance of Creative Director Gaia Trussardi and stylist Katie Phelan was created images, impregnated with the spirit of the city. The collection includes jewelry in its original color scheme: muted tones of blue, caramel and khaki are combined with rich shades of yellow, sky blue, light green and orange. The skin is a key element of the collection. Shirts, skirts and dresses adorned with leather inserts and bright patterns. All things are produced according to the unique experience of the brand Trussardi and fit harmoniously into the urban context. The collection complements the bright line of handmade accessories. Model Gita bag attracts all the attention on himself. Form bags was inspired by the historical archives and reinterpreted to reflect the latest trends. The new model combines vintage chic and current trends, becoming a true epitome of versatile elegance. It is suitable for modern women who lead an active lifestyle and love to travel. (CA) Get FREE SHIPPING on All Orders at HSSweden.ca! (Valid 11/28-12/24)! Shoes, clothing and accessories from exotic skins — in all times was a sign of status. In Gucci, Prada, Louis Vuitton and other top fashion houses and then there are things from crocodile skin, Python, Stingray or sea snakes. Do not have to wait for the new season — a welcome bag, belt or shoes can make to order. Then you can be sure the thing will last long and will go perfectly with the image. In Moscow for such work is the Atelier “Workshop of Classical Suit“. Here will help to find quality material, will develop a total-bow and tell you how and what to combine it with a bright accent. There are some of the most popular types of leather used by the fashion designers, skin, sea snake, Stingray, Python and crocodile. Skin, sea snake and Python are appreciated for flexibility, uniqueness — two of the same drawings do not meet — and the softness. Python skin is even more durable — it will last 10-15 years, while the leather-sea snake — 5-7 years with careful care. The most durable material — Stingray leather and crocodile. In Japan since the days of the middle ages used the Stingray leather for leather armor, and winding the handle of the katana. She is not afraid of heat and humidity and it is almost impossible to break. The product made of Stingray leather will last about 30 years. But the crocodile leather still durable. Bag, case or strap will last more than 50 years in perfect condition. Accessory or item of clothing, shoes made from exotic leather is a bright accent that is harmonious with “quiet” things from the basic wardrobe. Best thing from exotic leather highlights the classic look. Of course, you can skillfully combine the ripped jeans and bag from the crocodile. But as a luxury item, this style requires dignity and moderation. And the best of the classics nothing can emphasize these qualities. “Workshop of Classical Suit” — elite Studio-boutique, where fashion returns to the classics. For more than 20 years tailors and designers Studio help their clients to create an individual style, find your harmonious image and highlight personal qualities. Feel the difference and see the benefits of a classic suit from the “Workshop” already did many famous people of Russia and the world: Ksenia Sobchak, Timati, Basta, Sergey Shnurov, Kostya dzu, Eric Roberts, Cary-Hiroyuki Tagawa. Today “Workshop” is among the five best Studio in the world. The company cooperates with leading manufacturers of fabrics and yarns. Each year, the Studio employees attending the European fashion shows and fashion weeks, gain experience and show their achievements. What is a fur set? How many skins are in it and what they can create? The experts of Black Sable talk about the possible options, taking into account fashion trends. Fur set is a certain number of skins with which to sew the model of clothing, which perfectly fit a specific person. But before choosing the best style to supply the goods, you should understand how many skins will be required for tailoring of fur coats, of which you dream. The experts of Black Sable know about sable fur everything — and of course, I can recommend the most current models of fur products from different quantities of skins. The number of sable skins have on a short coat, either on a model of outerwear, where fur is combined with the cloth (by the way, what is the height of fashion!). First, let’s talk about coats. Classic, timeless style — just below the waist with a belt. But there are ultra-short clothing above the belt line — they tend to be designed for the combination with long dresses or with jeans with a high rise. These include a coat avtoledi — fashion invention of the last few seasons, has fully proved its utility and huge popularity. In fact, it’s a short coat, and in fact — outerwear with a comfortable fit for those ladies that spend a lot of time driving in the winter. There is another practical and attractive products from a small number of sable skins. The idea of the designers was brilliantly simple: to create a garment, the rear part of which (i.e. “back”) would be made entirely of fabric, and the front — fur. The sleeves of this coat are also usually made from thick fabrics, optional decorating with fur only on the bottom. This type of coats is not only economical, but also probably the most pragmatic option fur without sacrificing style, on the contrary — luxury sable it emphasises the contrast with the dense tissue. Fur vest — not leaving the fashion ratings for your fur. The actual length (which is enough for 25 skins) — thigh or to the knee. And the most appropriate style of vest is straight, because its beauty is in the exquisite simplicity of the black sable fur! By the way, is the most fashionable sable is a solid mech with no gray. In addition, a minimum of fur set , you can create sophisticated elements for coat: oversized collar, cuff, finish the zipper. Not to mention the small accessories for the winter. The priority here is fur coats and fur vests of medium length. Length fur coats to the knee easy for women leading an active lifestyle — in this outerwear is comfortable to walk and drive a car, it can be worn as a dress, and pants, and even jeans. The most stylish and latest models fur mid knee straight or tapered: these options allow the most advantageous cut to showcase the beauty of the texture of the fur surface and the attractiveness of the figure of the owner. The sleeves of these coats do as fur and fabric or dense knit. The coat of the 60 sable skins: the ultimate in luxury! About fur coats full length never say that they went out of fashion, so it is a priori advantageous option for the owner of the product. Long coats are sewn MIDI (mid-calf) or Maxi to the ankle. Among them there are direct and slim models — owners of long coats straight cut can wear them with a belt. In addition, a large fur set is enough for a long coat silhouette “trapeze” — with extension from the chest to the bottom: this style emphasizes the loftiness of figures, and a wide lower part of the coat thus forms a beautiful soft folds. However, the company Black Sable says: whatever the length of your fur being sewn from natural sable, it is in any case will look luxurious, elegant and attractive. The first TAG Heuer chronograph, wearing a prestigious distinguishing mark “Tête de Vipère” issued Besaranska National Observatory. Since 2006, only 500 models of watches have passed this exclusive certification. A unique series, limited to 155 copies, dedicated to the 55th anniversary of the release of model Heuer Carrera. In 1897 distinguishing mark “Tête de Vipère” was first assigned to Besaranska chronometer by the National Observatory. The key to high metrological quality watches, this emblem is a sign of superiority and incomparable precision. Forgotten 70 years, and then revived in 2006, the “Tête de Vipère” since that was done only 500 models. To obtain this distinctive every evidence of fully assembled watches under the Protocol are subjected to the 16-day test in five positions and at three different temperatures. Besaranska national Observatory on behalf of the International Bureau of weights and measures is the only public independent body with the authority to check the chronographs. This is not only a proof of quality and precision, this sign also proves the technical prowess that is close to perfection. The sign shall certify the watch as a whole, not just the movement. Today the brand TAG HEUER presents a new, ultra-modern version of chronometer TAG Heuer Carrera Tourbillon Chronographe Chronomètre with the latest design, which features two of the most well-known complications of traditional watchmaking: a tourbillon and a chronograph. The clock mechanism is placed in a spectacular ceramic case midnight blue, complemented by the bezel and lugs, also made of ceramic. Blue accents are present on the inertial load and the drum of the clock mechanism. Decorative elements with polishing, grazevaya and Microterminal complement the elegant, modern design and represent the highest technological quality, traditional Swiss watchmaking. Mark “Tête de vipère” printed on the bridge, visible through the transparent case back of sapphire glass. 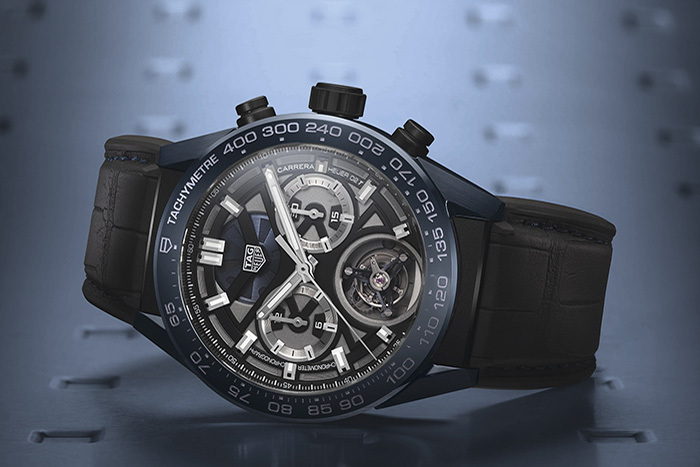 Watch with beautiful strap made of black alligator on black rubber lining with blue stitching in a subtle, sporty style of the brand TAG Heuer. Symbol of adaptability, high level of quality, performance and impeccable craftsmanship of the manufactory, perfectly balanced production processes and costs, the model TAG Heuer Carrera Tourbillon Chronographe Chronomètre “Tête de Vipère” perfectly complements “the genetic code” and the principles of the manufacture TAG Heuer in the avant-garde since 1860. Follow this link to get 30% discount on two or more men's underwear. Shipping is free on orders worth $100 or more. Restrictions may apply.